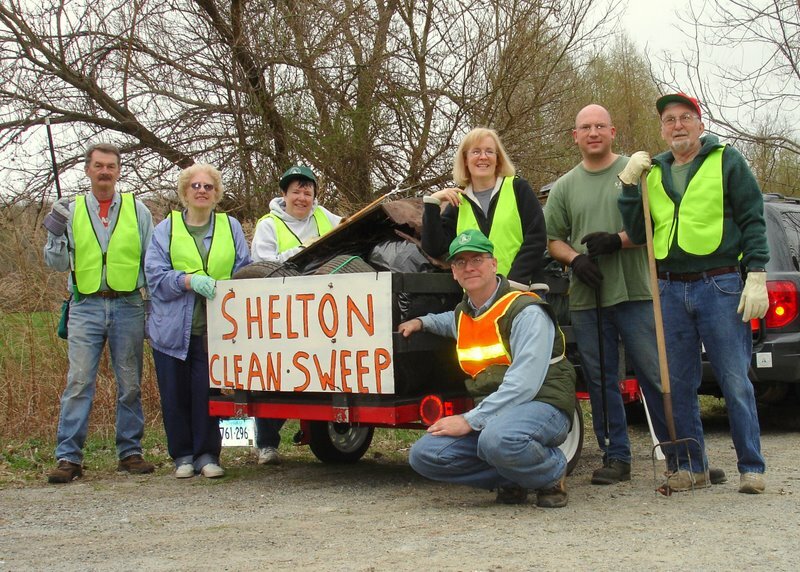 For our 6th annual Shelton Clean Sweep, more than 640 volunteers removed 340 large bags, 65 cubic yards, 2575 lbs of scrap metal, and 3 full pickup trucks of litter from our roadways, waters, school grounds, and waterways, as well as a variety of larger items such as tires, vinyl siding, sheet metal, mattresses & boxsprings, propane tanks, roof cement, parts of a deck, chunks of plastic, construction debris, etc. These are just the cleanups we know about. Many other people cleaned up without reporting it. For everyone involved: THANK YOU. Boy Scout Troop 28 - "Heavy Metal Champions" for removing 2500 lbs of debris, mostly scrap metal, from the Wiacek open space. Cub Scout Pack 27 - "Volunteer of the Year" - Civic Group category for removing 41 bags of litter from East Village Park. Tighe & Bond - "Volunteer of the Year" - Business category, for removing 25 large garbage bags of litter from parts of Isinglass Road and Huntington Street. George Waters - "Volunteer of the Year" - Individual category, for tirelessly cleaning up the banks of the Housatonic River by canoe and kayak year round and cleaning up around the Shelton Canal, removing about 30 large bags and other assorted debris from our waterways. Housatonic River Cleanup, Inc. - "Housatonic River Champions" Special recognition for the largest cleanup in Shelton. This year, 168 people removed an estimated 65 cubic yards from the river and piled it up at the Sunnyside boat ramp. 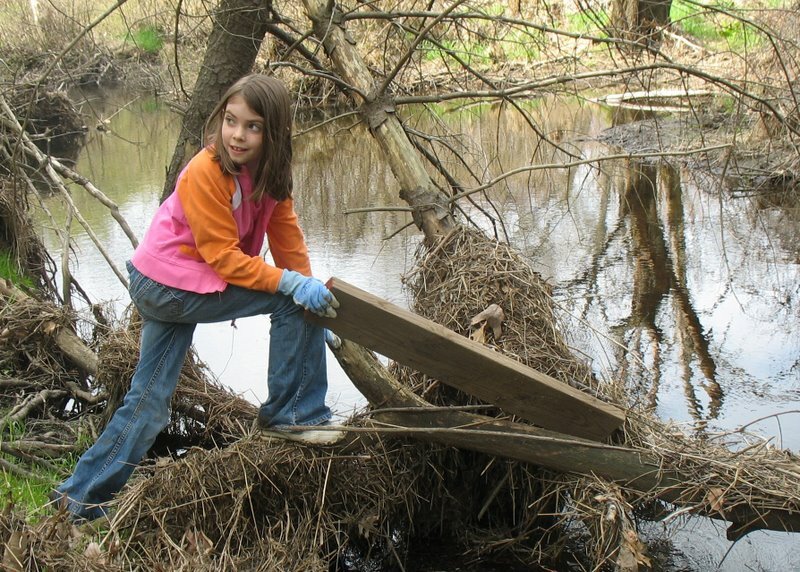 This is only part of their efforts, however, which also included more volunteers removing litter from the Housatonic in Stratford and Milford. Shelton Land Trust and Neighbors - "Best Find" - for pulling an old motorcycle out of the woods, along with three pickup trucks worth of junk from the open space adjacent to Wake Robin Drive. The Spillane Family removed abotu 75 lbs of litter from Perry Hill Road. Girl Scout Troop 60058 removed a bag of litter from the Rec Path near Lane Street. Ingrid Waters* has removed about 75 large bags of litter in the past year from Long Hill Cross Road and parts of Bridgeport Ave. (*Has formally adopted Long Hill Cross Road). Girl Scout Troop 60062 removed 7 large bags from Long Hill School and along the Far Mill River near Rt 110. Cub Scout Pack 25 removed 3 bags of garbage from the Mohegan School grounds. Girl Scout Troop 63140 removed a bag of litter from the Mohegan School grounds. Melissa Cosscia & Jessica Masulli cleaned up 3 large bags from Hope Lake, the Community Center, and Booth Hill School. Girl Scout Brownie Troop 60730 removed 3 bags of litter from Riverview Park. Girl Scout Troop 60086 removed four large bags and "a weird, decaying plastic square" from the open space along the River Walk. kosturko klean sweep removed 3 bags, a tire, and some metal bars from Booth Hill Road. Stone Gardens Farm* removed 11 large bags 4 tires, 1 rug, car seats, and rolls of electrical wire from Birdseye and Pearmain Roads, (*then formally adopted a portion of Birdseye Road). The Gallagher Family removed 16 large bags of litter from a portion of Mill Street and the Far Mill River. Girl Scout Troops 860 and 60041 cleared three bags of litter from Elizabeth Shelton School. Friends of the Shelton Dog Park removed 2 large bags from the Dog Park. Boy Scout Troop 55 cleared 8 bags of litter from the Shelton High School grounds. Cub Scout Pack 28 removed 10 large bags of junk from the Nike site. Girl Scout Troop 60778 removed 2 bags of trash from Elizabeth Shelton School. Girl Scout Troop 60650 collected 3 large bags from Elm Street & Coram Ave. Girl Scout Troop 60394 filled 4 kitchen garbage bags with litter from Hope Lake. Girl Scout Troop 280 removed 14 small bags of trash from Sunnyside School and did some landscaping while they were at it. Ivy Brook Medical Center* removed 3 large bag from Constitution Blvd South (*Adopted a section of that road). David Morais* removed 7 large bags of litter from Indendence Drive and Willoughby Road (*has formally adopted portions of these roads). Ellen Cramp removed 3 large bags of litter from #1-#39 Coram Road. Conner Diaz cleaned up 2.5 bags of litter from Riverview Park. Girl Scout Troop 64164 removed more than 2 bags of litter from Constitution Park. Pat Gajdosik and helpers filled up 3 taping buckets from Land Trust open space off of Barbara Drive. Sheri Maybeck-Dutkanicz removed 3 large bags of litter from Meadow Street. Caitlin McGuire family & friends collected 10 large bags of litter from Booth Hill Road at the Aquarion property. Tom Christiano hauled Caitlin McGuire's bags from the side of Booth Hill Road to the transfer station. Cub Scout Pack 24 collected 10 garbage bags of litter at the Booth Hill School grounds. The Pastore Family filled up 2 large bags with litter from the Far Mill River, Yutaka Trail to Farmill Crossin. The Farmill River Association removed 8 large bags of litter, construction material, and other items from the Far Mill River behind the Hilton. Boy Scout Troop 19 removed 6 bags of trash, a lawn mower, and some cables from Rt 110 along the Land Trust Nicholdale Farm property. Daniel Dognin collected 8 large bags of litter from the Long Hill & Constitution Blvd area. Mike Clay* removed a few dozen bags from Platt and Long Hill Cross Roads, and many larger items including a vacuum cleaner, metal fencing, a refrigerator box, sheet metal flashing, and a bike. (*Adopt-a-Street participant). Lisa Roshkind picks up 2 large bags of litter each week during the spring and summer from the Indian Well Road area.